American (Pawtucket, Rhode Island), The Newsboy, 1888. Carved, assembled and painted wood with folded tin. Milwaukee Art Museum, The Michael and Julie Hall Collection of American Folk Art. Photo by John Nienhuis. The Museum often uses The Newsboy as a poster child for our spectacular Michael and Julie Hall Collection of American Folk Art. The education department includes it on our Family Audio Tour, and the energetic boy has a place of honor on view in the Museum’s Folk & Self-Taught Galleries on the Upper Level. However, I personally didn’t know a thing about this wonderful….er.. sculpture? Statue? Sign? I didn’t even know what to call him! For this “From the Collection” I thought it was time for me to learn more about this Museum treasure. The Newsboy is a trade sign. An artful sculpture, certainly, but also an object that was made with a pragmatic purpose in mind. In 1888 Pawtucket, Rhode Island, where this trade sign was made by an unknown artist, a larger percentage of the population would have been illiterate. Merchants relied on eye-catching storefront signs like this one to grab the attention of passers-by without the need for words. The Newsboy wordlessly advertised the Pawtucket Record, a weekly newspaper published from June 1886 until 1890. 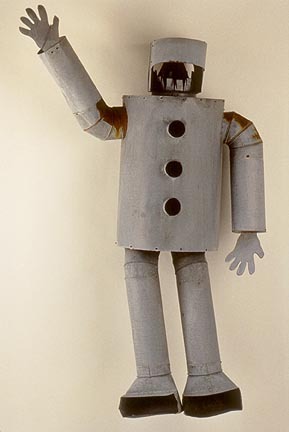 Though we often think of flamboyant trade signs in their 18th or 19th-century contexts, the Hall Collection also includes The Greeter, a 1982 robot made of galvanized steel duct parts that once sat atop the Duquet & Sons Heating Company store in Highland, Michigan. The Greeter is also on view on the Museum’s Upper Level. Bruno Podlinsek (active 20th century in Highland Michigan), The Greeter, ca. 1982. Galvanized steel duct parts assembled with 'pop rivets'. Milwaukee Art Museum, The Michael and Julie Hall Collection of American Folk Art. Photo by Efram Lev-er. Sculpturally, The Newsboy is vibrant. A young boy is captured in motion, his leg kicked back and his arm in full stride. His right arm is thrust forward, firmly clasping and pushing forward the front page of the newspaper. His mouth is held open, as if he is yelling the latest headlines. His coat gracefully swings open, highlighted with faded red paint polka dots. Socially, the sculpture of a young boy engaged in active employment might remind us that this child is not in school. The Newsboy reminds us of the not-long-ago era in America when child labor was commonplace. Children could be legally employed for long hours and low pay in often dangerous jobs. During the 19th century, the labor force moved from small home-based production and farms to urban areas and factory work. Employers often preferred children, because they were viewed as more manageable, less likely to strike, and they didn’t demand higher wages. Newspapers hired children like this newsboy, nicknamed “newsies” (Remember this 1992 movie of that name? ), to sell newspapers directly to customers on the street. It was 1938 before a US Federal law regulated child labor. I found this website to be a great resource for a quick history on child labor. Detail of The Newsboy, 1888. Photo by the author. 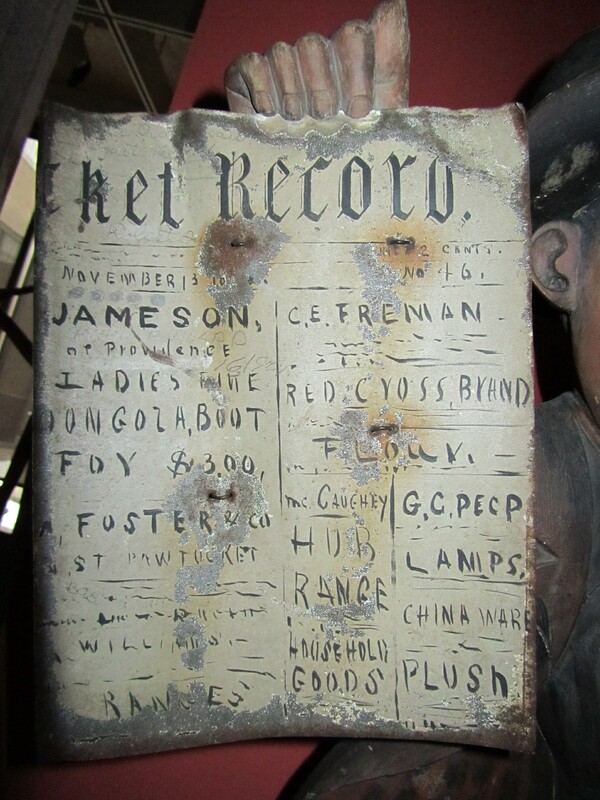 Above is a close-up of the newspaper that the boy juts forward, dated November 13, 1888. If you read closely, you see that the majority of the headlines aren’t really hard-hitting news at all–the front page shows advertisements! In the left column we can read that a pair of ladies’ Dongola boots are on sale for $3.00 (Here’s a link to an 1897 Sears Roebuck & Co advertisement showing “Dongola” boots). The right column shows merchants named C. E. Freeman and McCaughey selling brand name items like Hub ranges and Red Cross brand butter. 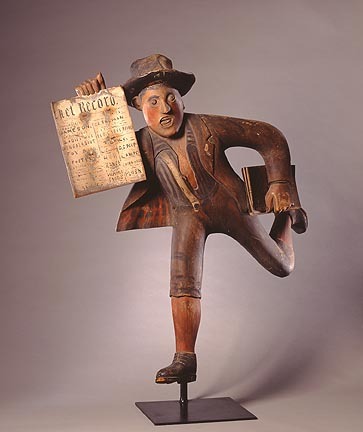 The Newsboy came to the Milwaukee Art Museum as part of the folk art collection amassed by Michael and Julie Hall. 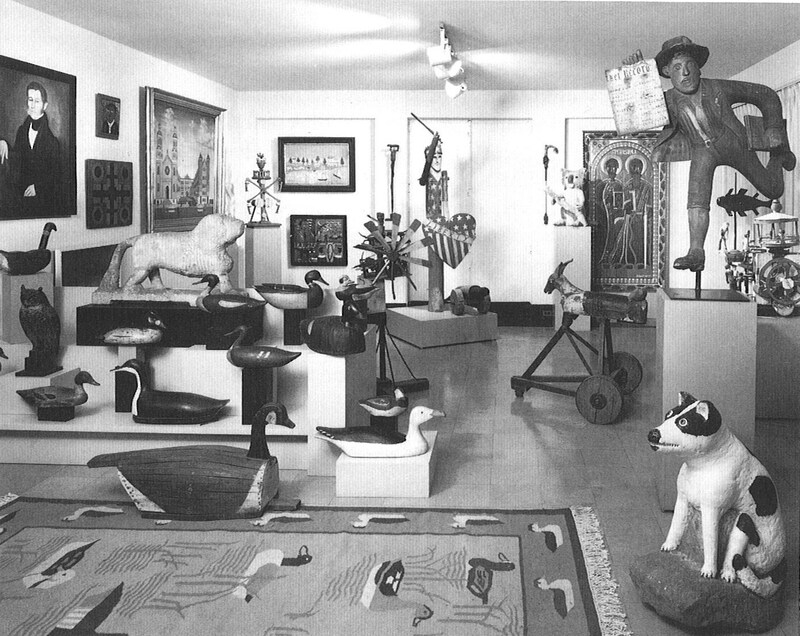 In 1989 the Museum welcomed this tremendous group of objects, and by 1993 created a traveling exhibition and scholarly catalog entitled Common Ground / Uncommon Vision: The Michael and Julie Hall Collection of American Folk Art. Comprised of some 270 objects dating from the 18th century to the present, the group is one of the nation’s premier collections of American folk art. With many of the objects on view on the Museum’s Upper Level, the collection reveals both the traditional roots and individual creativity of folk art from 18th-century colonial America. It includes the work of better known, but self-taught artists such as Bill Traylor, Edgar Tolson, Felipe B. Archuleta, Elijah Pierce, and Mose Tolliver, but also the work of nameless artisans like the maker of The Newsboy. 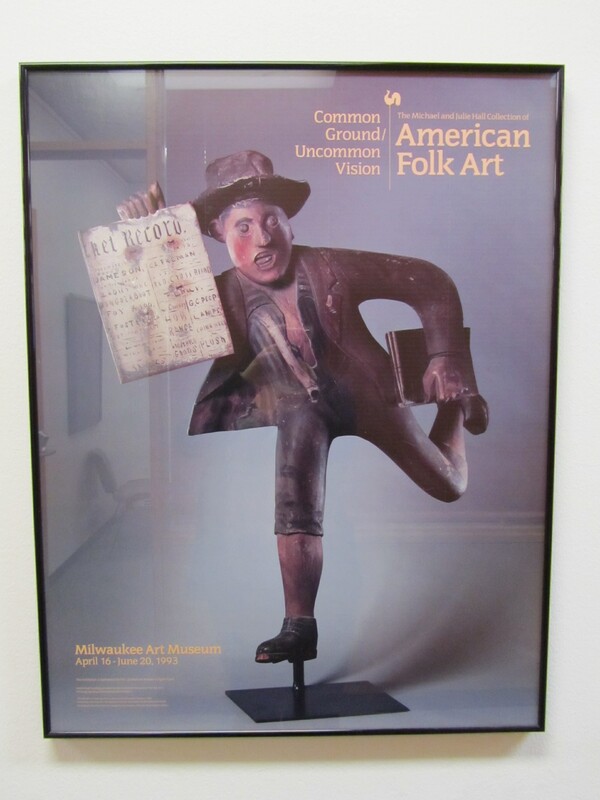 Exhibition poster featuring "The Newsboy" for the Museum's 1993 exhibition "Common Ground/ Uncommon Vision: The Michael and Julie Hall Collection of American Folk Art". This entry was posted in Art, Curatorial and tagged 19th Century Art, Collection, folk art, From the Collection. Bookmark the permalink. Love seeing the image of the work in the collectors home – I always forget about this collection when I am at MAM – but this post has inspired me to really explore this area the next time I am there. I agree, Keith! I walk past the Folk/Self-taught arts every day and rarely take the time to enjoy it. Perhaps with our planned 2013 reinstallation, we’ll be able to highlight these materials to make jaded folks like you and I stop and take a breath!